With LicenseSpot, you just pay for the activation server and the protection library comes free. LicenseSpot includes all the needed components to protect your application: licensing library, activation component and activation server. No need to buy them separately. Automatically deliver serial numbers to customers when the license is created. You have full control of the email content to suit your needs. 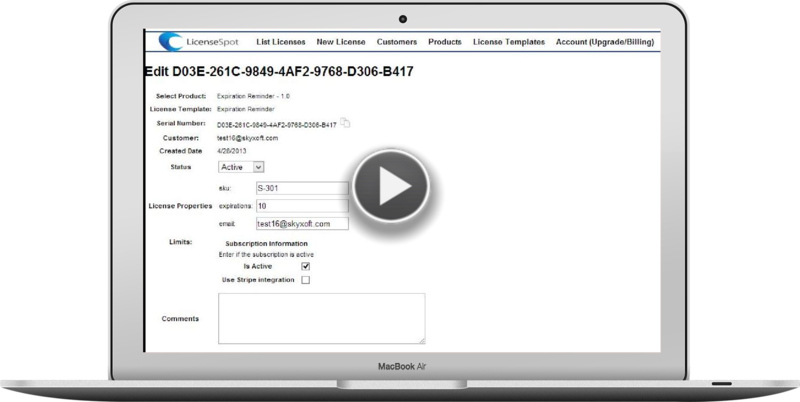 Manage your customer information in one place with LicenseSpot. Know what serial number and what product and version a customer has for better support. No need to have license files all over the place. Subscriptions, trial, feature limits or hardware lock. Enfore your business rules without writing code change rules on the fly without recompiling your application. Lock licenses and applications to local computers and prevent sharing of your application without proper rights. If a license has been compromised you can revoke the activation and invalidate the product remotely protecting your intellectual property. Out of the box integration with FastSpring and Stripe. Use our REST API and create licenses on the fly with minimal code. "Your licensing system is awesome! I like it very much, and I'll definitively pursue using it as long as my software or any other product i may create would need a license system"